Loreto Secondary School, Balbriggan is a catholic girls’ secondary school. In the spirit of Mary Ward we aim to develop all the abilities of our students in order that they realise their full potential and use their talents for the service of others. 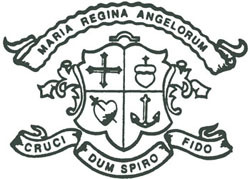 This is the crest familiar to Loreto pupils worldwide. It is surmounted by the words "Maria Regina Angelorum" which indicate the patronage of Our Lady, Queen of Angels. The bottom scroll is: "Cruci dum Spiro fido" - "Throughout my life, I shall place my hope in the cross".